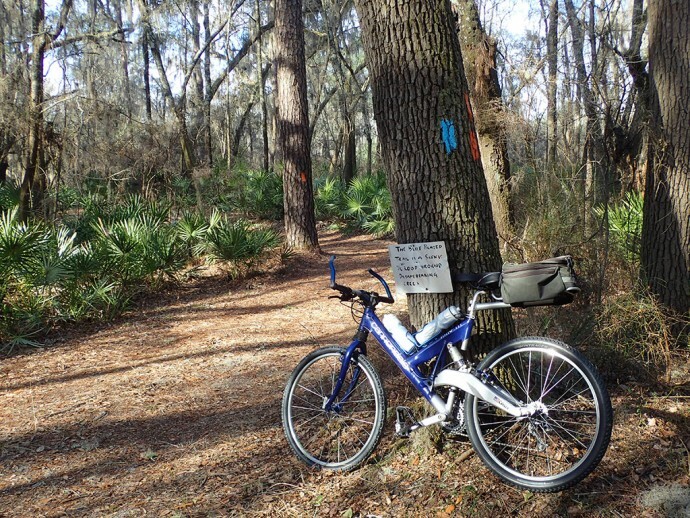 Mountain biking and the Florida Trail | Florida Hikes! It’s Florida Biking Month! Which makes it a good time to talk about bikes and the Florida Trail. This hiking season, quite a few thru-hikers and section hikers have been surprised by running into mountain bikes on the Florida Trail – or more properly, mountain bikes running into them. Each had their own tale. Quite a few were in their tents in the middle of the night and had headlamps shining at their tents only a few feet off the trail. It was after dark, and the only other person who might come by would be another hiker. Or so they thought. It was late, between midnight and daybreak, when a group of riders raced past. I’m a mountain biker, and I have been for over thirty years. When I started, mountain bikes were nothing more than modified road bikes with wide off-road tires and flat handlebars. Mountain bikes have changed over the years and have become very popular. They are lighter, faster, and are now able to ride through almost any trail conditions. The tires now look like off-road motorcycle tires. Which also means they now cause much more damage to a foot trail. I know mountain biking is a great way to get outdoors, and hit the trails. Just NOT on the Florida Trail. It is a nationally recognized footpath, a National Scenic Trail. Sure, there are some places where bikes and hikers share the trails. Those areas are signposted and designated as multiuse sections, and are usually paved or a graded surface. Here in our own back yard we have the Seminole Wekiva Trail and the Cross Seminole Trail, where bicycles, roller bladers, skateboarders, walkers, and Florida Trail hikers all share the same path. Along this route, you expect to share the path. But not in the middle of the Ocala National Forest, on the Florida Trail, in the middle of the night. 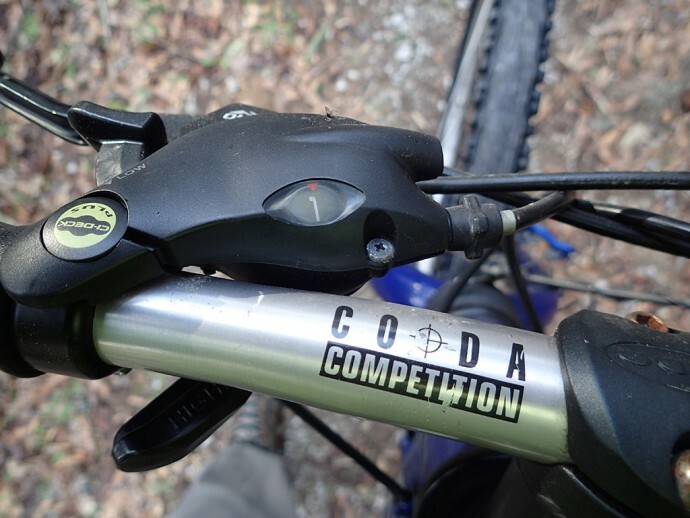 If you get passed by a mountain bike in the woods while hiking on the Florida Trail, take a quick photo and let the Florida Trail Association, the land manager, or the Florida Trail Hikers Alliance know where and when. 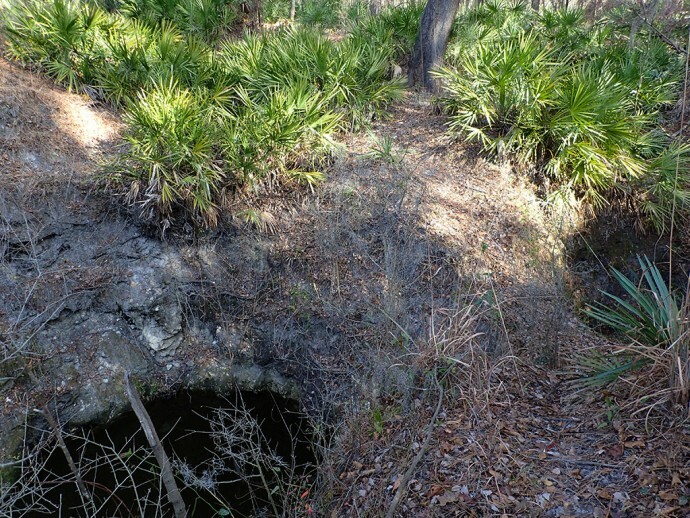 To stop this growing problem, it may take more signage and more enforcement by the USDA Forest Service, the overall manager of the Florida Trail. Plus contacting the various mountain bike clubs and organizations to remind them of the rules. 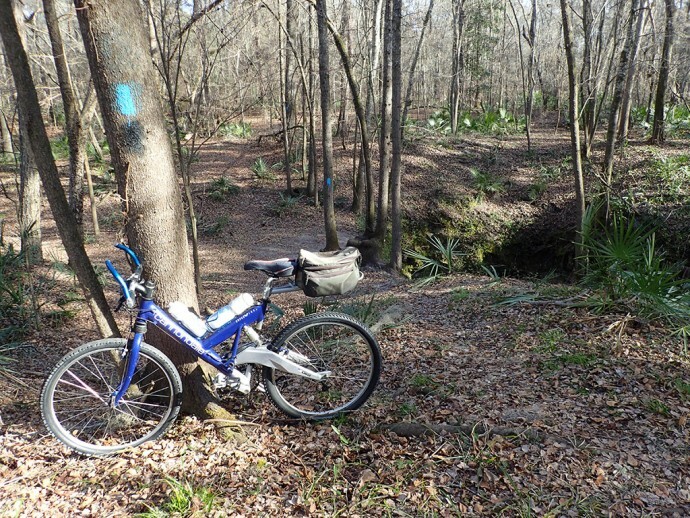 I recently combined a little mountain biking and a bit of hiking along the Suwannee River. 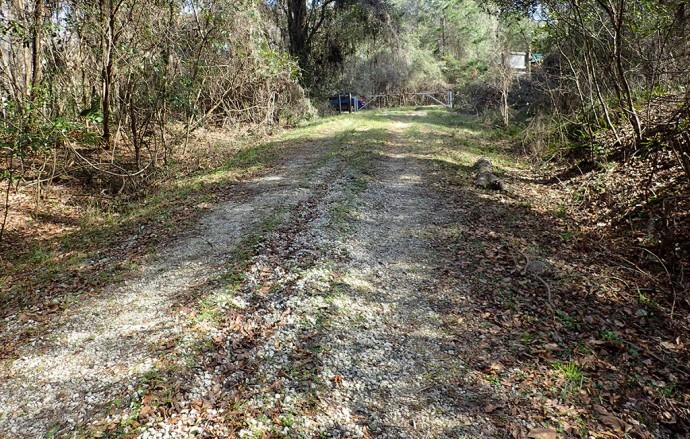 At Camp Branch, a trail posted as open to bicycles leads to the Florida Trail in two locations. I took the white-blazed route that took me to a blue-blazed loop around Disappearing Creek. The ride was doubletrack, short, and mostly downhill as I was heading toward the river itself. When I came to the Florida Trail intersection, I stashed my bike under the palmettos, added a branch or two covered with moss and started my hike. I was following the orange blazes down an old forest road. It was nearly impossible to see the river from the road. 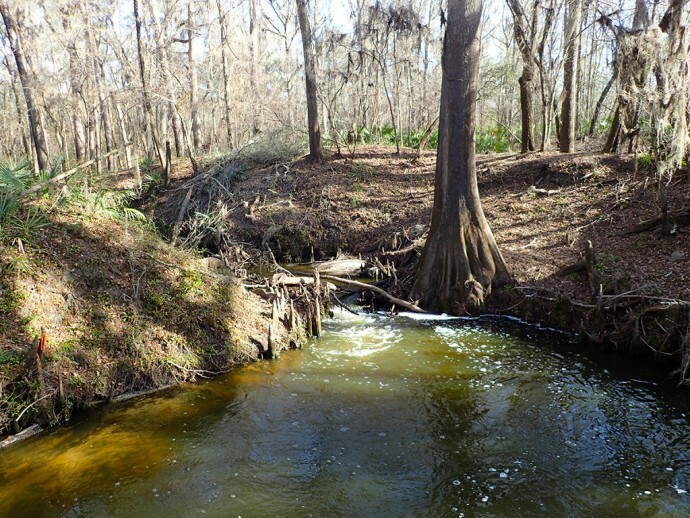 Wanting to at least say that I’d hiked along the Suwannee, I followed a lightly worn path in the direction of the river. I hit the jackpot! I found myself hiking on what must have once been the Florida Trail. The narrow and well-worn path followed the bluff. As a prize for taking the “path less taken” I came to what almost felt like a natural bridge, with a small sink on one side and a little river cove on the other. When I turned around, I crossed my little natural bridge again and returned to the bike path that had stopped at the Florida Trail. I wondered what the other direction of the Florida Trail might look like. Would it be more forest road? I was surprised and happy to once again be following the orange blazes along a nicely groomed pathway through the river forest. Happy with finding such a pretty piece of the Florida Trail, I continued on the blue-blazed trail to visit Disappearing Creek. I could hear the creek before seeing it. 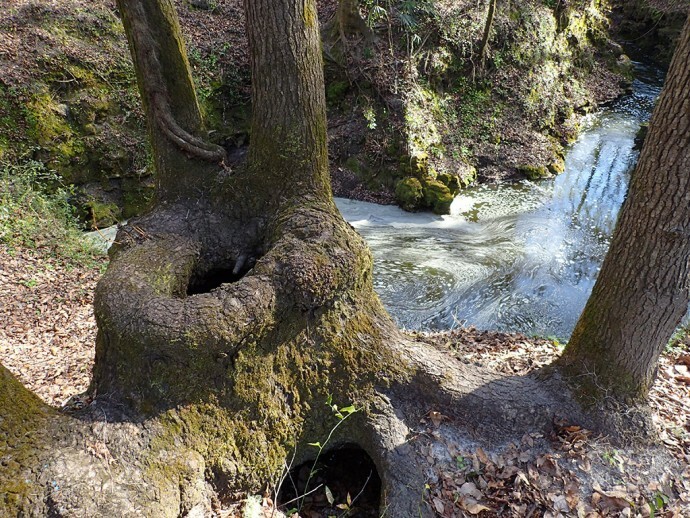 Soon I was standing beside a deep sinkhole with a fast-moving creek entering the other side. All that water, and the level in the creek never changed. What goes in must go out, so there is a heck of a hole at the bottom of this sink. The blazes led me along the twisting and turning of the creek. Here, great examples of oxbows in miniature can been seen and photographed. Small rapids create the only sounds as the water flows past limestone formations, large cypress trees, and hundreds of cypress knees. I was so taken by the sounds and beauty of this place that I didn’t notice the faded signs attached to the walkway boards of the bridge. To me, a big fancy bridge is a luxury, I am happy to find a nice log or two. If there happens to be a rope or handrail, it’s nothing more than a bonus. I carefully tested the bridge, gave it a couple gentle jumps, and quickly was on the other side. Looking back, I found a big “bridge closed” sign. Not just one, but two, both on the same tree. Looking back to the other side, I could see a sign. I assume it was the one telling me that the bridge was closed. It was on the non-creek side of the trail, and I never saw it. I guess I was just too into hiking alone in the sounds and glory of nature next to Disappearing Creek. Back to the trail intersection, I met up with Sandy and recovered my bike. She would enjoy the 1.3 mile walk back to the trailhead, while I traveled the same distance very quickly on the same uphill shared path. I love to hike, and I love to bike. Combining both made it a wonderful trip. The USFS document at https://www.fs.usda.gov/recarea/ocala/recreation/hiking/recarea/?recid=32318&actid=51 states that biking is allowed on “specified segments”. Do you know where these are and aren’t? We know about some of them. The USFS & FTA said they’d be putting out a document with those details so we haven’t taken the time to compile one. All bike paths are fine. After that, it entirely depends on the land manager and varies from public land to public land. For instance, anywhere in St. Marks NWR where the trail is on a marked forest road / levee, you can. Where the FT leaves the road, you can’t. Similarly on water management district land along the Kissimmee River. But along the Suwannee it varies from parcel to parcel. If you’re thinking of heading to a particular section, call the land manager to check. I would think that given the increasing popularity of backwoods bikepacking, the Florida Trail Association would reconsider allowing bikepackers access. There are many gravel trails that could be connected via the FT to other wildlife areas. Florida wildlife areas should be enjoyed by everyone, not just the hikers. It’s not as simple as that. We’re avid cyclists as well as hikers, and recognize that there are many parts of the Florida Trail where cycling isn’t a smart idea because of the soils involved. 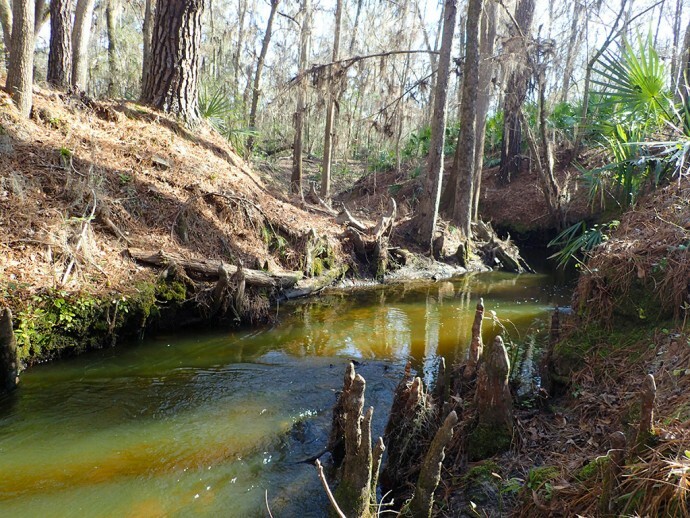 Riding through a swamp or a scrub forest with mountain bike tires causes a lot more harm to the habitat than walking through it does, and adding to erosion in areas that erode easily – like the sidehill along the Suwannee River – means that the trail will end up relocated away from the great views to avoid worse erosion. We’d rather not see that happen. We understand that the US Forest Service will be publishing its own list of which portions of the Florida Trail are open to mountain biking sometime this season. What about Alligators in Florida? That’s the only thing that keeps me from visiting. When you live with dangerous creatures, you get used to being alert about them. Honestly, alligators are only a problem if someone feeds them (then they associate the shape of a human with food) OR you do something that makes them think you’re prey, like wading into weeds in a pond or leaning over a body of water at dawn or dusk. Have you read our Florida 101? That may help. We’re as worried about grizzlies as you are of alligators, and we think they are far more of a threat to hikers. We know of no attacks on hikers by alligators. Swimmers, dogs, and small children, yes. But not hikers. I carry a hiking pole not just for my knees but to fend off critters when necessary, and I’ve only used it for that a couple of times in thousands of miles of hiking here, to whap it on the ground to get a gator to move along back into the water. So can you or can you NOT bike on the sections of the Florida Trail between Juniper Springs to Hopkins Prairie?